The story is all too familiar: Whenever there is scarcity in something, whenever a need once met through the crafting of genuine relationships can no longer be satisfied, its satisfaction is catered to a product. This is so evident, and has come to be so much our civilization’s reflex, one can argue that when the sirens of the market begin to sound, this is the lament for something that is dead. Only that here, the dead are not buried and lamented properly, in the way all passing people and ideas should: By putting them underground, remembering them for what they were, keeping the good they gave to us, using it to create something new. The sirens’ song is a false lament, one seeking to mask the sad, disheartening reality of the event with noise, confusion, and by stirring up a longing that can no longer be satisfied. There is no catharsis, the loss cannot be fully realized, understood and overcome. Instead, it turns into profit. Among our unburied dead there lies the corpse of the mentor. Fortunately, not the Mentor per se, as meaning and possibility. I was lucky enough to find this in my father and know that Mentors do exist. The mentors in question are the ones traditionally found in establishments meant to perpetuate the practice and ways of a craft or profession. And what signals among other symptoms their death is the sudden surge of “mentors” we see recently, in art, as well as in other professions, usually offered for a price. The mentor-apprentice relationship, no longer emerging naturally, as a social phenomenon engendered within institutions related to a profession, exists only as an anomaly, or as the vampire version of the mentor-protege framework that is force-fed (in lack of the real thing) to potential clients. The death of mentors started dawning on me early on, but, I am afraid, not soon enough. The joy I experienced, about fifteen years ago, when I succeeded in entering the Athens School of Fine Arts, that was, entering the school of my dreams, offered a first row seat to that reality. This success, that came after years of longing and trying, after a series of rejections, led to my encounter with this object of desire having the taste of rejection as well: This time served cold, by the School of Fine Arts priesthood, the artists/professors I wished to be a pupil of. An anatomy (or should I say post postmortem?) of that first encounter could be this: In theory, each “successful applicant” was to choose the workshop they wished to attend during their years of study, choose, in essence, their teacher. Only, in reality, it was the other way around. The professor chose the student, and in a way that was quite humiliating and disheartening, for the aspiring artist. After years of apprenticeship, most of them spent within institutions where one was taught “the right way to draw” (a process that came with a price tag and a hefty time and temporal investment), now the “successful applicant” had to line up his/her drawings before the School’s professors in order for them to determine (once more) whether he/she was worthy of being their apprentice. One was either chosen or rejected on the basis of a handful of more or less institutional drawings, during a procedure that resembled a parody of the initial, already insufficient, method of determining the applicant’s value. But, more importantly, this ritual was performing, a second, informal and essentially illegitimate judgment. In one of these five minute judgments -there I was, having spread what it felt to be some kind of merchandise in front of the master’s feet- the professor, after glancing at my drawings hastily, uttered “there are weaknesses”, to which I answered, “but this is why I am here”. Note that one was not always lucky enough to get to this informal showing, instead was rejected from first glance. This first encounter confused me but my gut saw this exactly for what it was, an injustice. I didn’t let this initial bad taste get to me though, instead I kept on hoping that somehow I could be part of a workshop as I imagined it, a structure where I could learn, be challenged and grow. The experience of the subsequent five years failed to justify the hope. In hindsight I realized that everything was structured in order to make the experience as painless as possible. Painless for the teachers as well as the students. One thus could easily reach graduation without really having been challenged, at least not due to a rigid and structured academic regimen. One would reach the end, the purpose, without really having been tested. Whatever gain one would obtain over these years would come in principle as a result of some kind of structure the “pupil” would succeed in imposing on him/herself, or merely as a result of more or less chance events of self discovery. Where were the teachers, you might ask? Where were the mentors? Those that know how to respect and receive respect in return and give for the sake of giving. It was a truth everyone seemed to avert their eyes from that our teachers had given up on their apprentices, before even trying. Looking back, it seems like they had decided early on not to engage. The students were left more or less to their own devices (there must have been some anomalies, some rare professor-specimens I wasn’t lucky enough to come across). And even when I came close to believing I had found one who seemed to be present, eventually, when the need of a deeper understanding emerged, the relationship crumbled; it wasn’t based on mutual respect and understanding, but on feeding the “mentor’s” need for power and establishing her undisputed authority. The mentor-apprentice relationship was but a bubble meant to be popped. Why, is the natural question that comes to the inquisitive mind. Why are mentors dead? How and when did this happen? As important as this is to resolve, it is necessarily part of a different discussion. Louis Aragon, the Surrealist poet, once stated: “All that is fragile must be broken”. And as much as I don’t see this dictum as being legitimate in every single case, I do see the point here. Given the urgency of shattering our illusions and whatever feeds on them, what we are called upon to do now is to bury our dead. 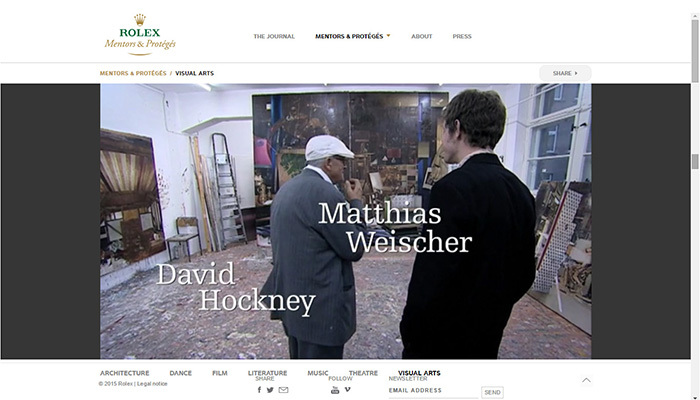 Image: Screenshot from the website of the brand “Rolex”, on the page of their “Mentors & Protégés” program.